Figure 8.7 The K-T boundary interval in the Nanxiong Basin, Guangdong, China (modified from Taylor et al. 2006). Various possible stratigraphie positions of the K-T boundary (KPB) selected in previous studies are indicated in the first four columns and summarized in the fifth; Taylor et al. favored KPB 1 in the fifth column. Reprinted by permission. r r that occupies parts of Heilongjiang, Jilin, Nei Mongol, and Liaoning provinces. They reported that an assemblage with Aquilapollenites and other triprojectate pollen, "Proteacidites" (= Tschudypollis), and Wodehouseia is present in the lower part of the formation. The assemblage in the upper part of the Mingshui includes abundant Deltoidospora and Ulmipollenites. They noted that the lower assemblage in the Mingshui Formation is comparable to that in the Lance Formation of Wyoming and the upper assemblage is comparable to that in the Fort Union Formation of the United States. Based on these observations, Hao et al. (1979) placed the K-T boundary between the lower and upper parts of the Mingshui Formation. Based on the data they presented, we concur with that interpretation. Hao et al. also called attention to similarities between the assemblages in the Mingshui Formation and those in the Tsagayan Formation of the Russian Far East (that formation will be discussed at length in Section 8.5). Song et al. (1980) briefly summarized palynological assemblages of Aptian through Miocene age in Jiangsu Province, which lies within the Aquilapollenites palynofloral province in northeastern China. The K-T boundary apparently is within the Taizhou Formation in Jiangsu Province. There the disappearance of species of Aquilapollenites, "Proteacidites" (Tschudypollis), and Wodehouseia was reported, along with an increase in conifer pollen said to reflect climatic cooling. The authors noted that the palynofloral change corresponds to the transition from the lower to the upper member of the Taizhou Formation, but see the discussion of the later work of Song et al. (1995), below. Song et al. 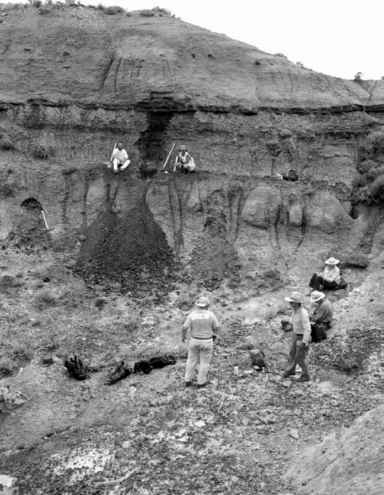 (1995) revisited the Maastrichtian and Paleocene of the Taizhou Formation in northern Jiangsu. They defined two assemblages within the formation; the lower one is divided into three sub-assemblages, and the upper one is divided into two sub-assemblages (Figure 8.8). They concluded that Jiangsu Province lies at the border of the Normapolles and Aquilapollenites palynofloral provinces because the Cretaceous sub-assemblages contain species characteristic of both. It must be noted, however, that these authors followed Song et al. (1983) in recognizing only two palynofloral provinces in China - the northeastern one with Aquilapollenites and a central one that includes both the southern and western regions, which they assigned to the Normapolles Province. The assemblage Song et al. (1995) described and illustrated from the lower part of the Taizhou Formation includes many of the ephedralean gymnosperm pollen species reported by Wang and Zhao (1980) and Wang et al. (1990), which characterize a distinctive palynofloral province in southern China. This disagreement about the presence or absence of the Normapolles Province in China notwithstanding, a change in palynofloras within the upper part of the Taizhou Formation was interpreted by Song et al. (1995) as marking the transition from the Maastrichtian to the Danian (lower Paleocene).